Only just seen this post and love the look of the work so far. Going to be a monster when finished and not short on the old ponies to surprise, lets face it, a few supercars out there. Look forward to seeing the progress you make. Looking forward to the progress to come, keep up the good work! Door is very close to me taking a mould, next job will be to turn the car around and replicate the wheel arch exactly on the other side of the car which should be a faster process, won't start until the work on the noble is complete. Not sure if i mentioned previously, but i am going to take moulds of the entire car and make it in vac formed carbon fibre, hoping the car will be around 1000kgs with fuel when finished. Last edited by Andygtt on Mon Mar 26, 2018 11:01 am, edited 1 time in total. Looking good! As you say, you wouldn't know that wasn't how it left the factory, great job. If you're going to create moulds from the whole shell and replace it all with carbon, I would imagine it'll come in a lot less than 1000KG, the original MK3 wasn't much more than that including the big cast iron V6. I don't know how the running gear and engine of the V10 compares to the original but I would guess it would be lighter. 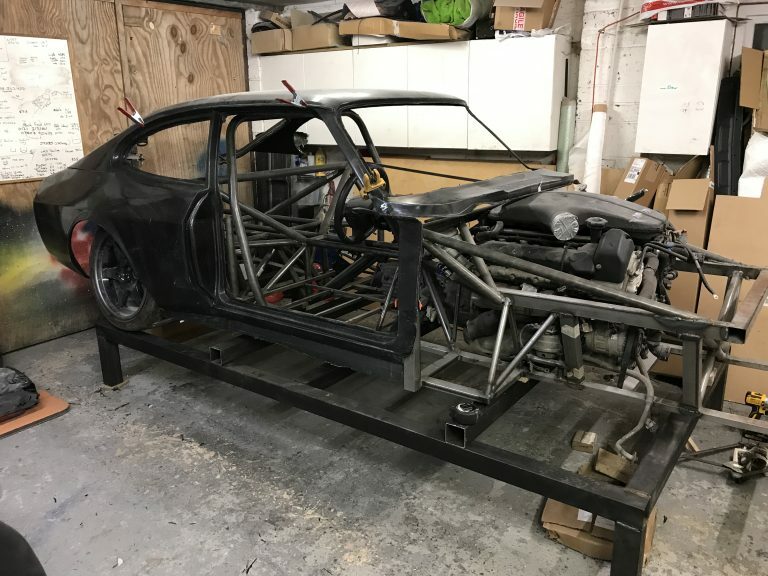 I assume, before you remove the body and replace it with the carbon copy ( see what I did there ), you'll be building a full cage inside (or at least a space frame)? Plan is to build a full space frame, it will also have my own design of double wishbone suspension all round and different alloy uprights etc, APs all round. 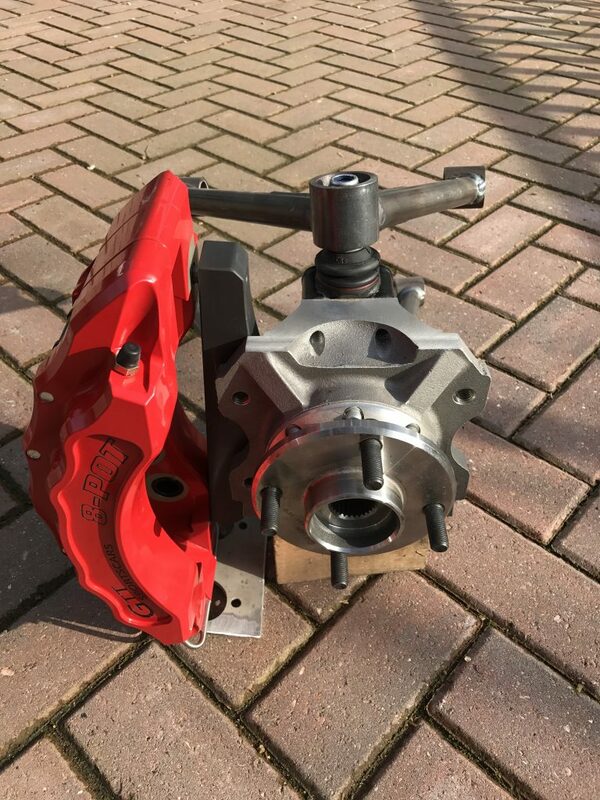 Sometimes plans do change and I have been seriously considering fitting the duratec V6 that I have developed a reliable turbo package for to over 700bhp.... It's lighter and easier for me to maintain, but won't have the noise of the V10 which is a big part of my vision for the car. I already have a monster car and the idea of this Capri was for it to be a more sensible car to cruise round Europe instead of the tight fit 2 seater..... I've even considered using air ride on the Capri as its come on a long way in recent years and suits supercars now. So... though long and hard about going back to my tried and tested V6 with silly power (my noble with its ford mondeo V6 has over 700bhp).... had to go right back to my original dream for the car, and that was for it to be a real oddball exotic, its not all about speed as I already have that covered with the Noble and to my ears the noble simply sounds meaty, not exotic. So I'm back to the original plan... started making the chassis in Feb, long way to go and i can't finalise the position of the roll cage until i have made the moulds of the tub as i want it a close fit to the new bodywork. Last edited by Andygtt on Mon Mar 26, 2018 11:04 am, edited 1 time in total. 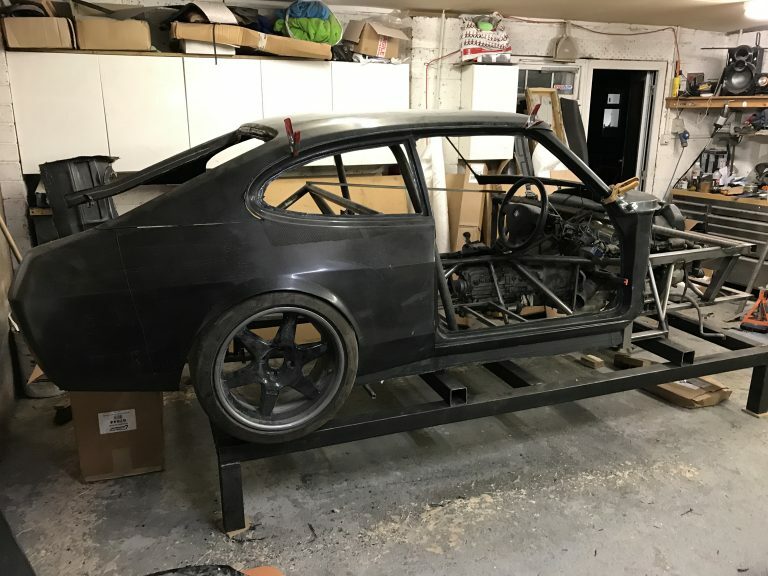 Andygtt wrote: So I'm back to the original plan... started making the chassis in Feb, long way to go and i can't finalise the position of the roll cage until i have made the moulds of the tub as i want it a close fit to the new bodywork. In all seriousness - will you be using it/selling it? Just curious, I'm sure it will be beyond my price range. This shell will be 'spare' and sold once moulds are made... as my wife keeps reminding me every time I talk about starting the moulds. Its a very very solid shell which is the only reason I haven't cut it to pieces to help progress the build, its just too good to sacrifice. Realistically it won't be worth a fortune IMO although a lot of people have expressed an interest in it once i now longer need it lol. Spent quite a bit of time on the chassis in Feb... I'm now back on bodywork and hope to start the moulds in the next month. Last edited by Andygtt on Mon Mar 26, 2018 11:07 am, edited 1 time in total. Andygtt wrote: This shell will be 'spare' and sold once moulds are made... as my wife keeps reminding me every time I talk about starting the moulds. Yeah, guess it's not worth a fortune in itself, but it's an invaluable starting point for someone starting out on a.... I was going to say "big project" but compared to yours I guess it's more of a medium project lol! I have been working on the Left side of the car over the last few weekends... basically I have to reproduce the shapes that I have done on the right side. You would be amazed how much filler goes into building basic shapes, of cause most of it ends up on the floor and eventually in the hoover lol. Initially after filtering i wanted to 'see' what i had so i premiered it and them glossed it up.... wasn't as close as i had hoped so i flatted it back and added filler. I them used a new product to me which is a polyester filler primer, effectively its like spraying a very hard filler over the car... fantastic stuff and really helped me get the roof closer to what it needs to be (remember I welded up the sunroof). After another flat back and some more filler on the roof I used a normal high build primer and its not ready for another flat back and hopefully so black. Last edited by Andygtt on Mon Mar 26, 2018 11:09 am, edited 1 time in total. Thought i recognised the pictures, saw them on facebook and wondered how much work had gone into that! Splashed a bit of black and quickly polished it up, now the roof, scuttle, passenger door and left rear quarter are ready for moulding.... going to spend some time getting the right quarter and door ready this weekend then I will start the moulds. Been using the alloy wheels that came on the capri for painting as i don't care if they get overspray (look terrible and tyres are unusable anyhow)... this pic shows them with 50mm of spacers on the hub lol. This is with the 10inch wide wheels (18s) that are being used on the car... I've made the car around 150mm wider at the rear. Last edited by Andygtt on Mon Mar 26, 2018 11:12 am, edited 1 time in total. Bit of an update, I made the first carbon bodywork mid last year and was able to finalise a lot of the chassis.... Ive also been working the final design of the front suspension, its all designed specifically for this car and from scratch so its taken a lot or planning. 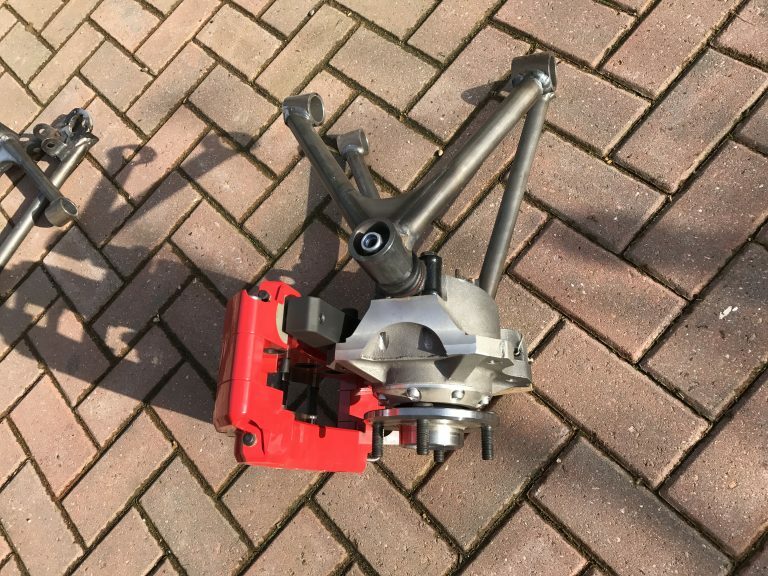 Over the last 4 months Ive managed to fabricate most of the front suspension and its starting to go together. Once its on I can fit the new front wheels (19x10) and fabricate the front arches. Arguably not a Capri now, but hey its gonna go and do everything well and look great with that body on it.